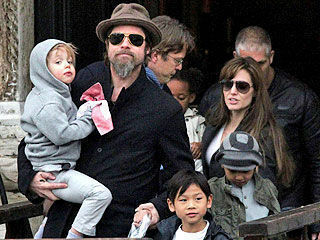 Brad Pitt and Angelina Jolie spent some time in Venice during the end of February. And of course, it was a family travel event with 19-month-old twins, Knox and Vivienne, in tow. Plus the rest of the Jolie-Pitt children, Maddox, 8, Pax, 6, Zahara, 5, and Shiloh, 3 also tagged along to enjoy the canals and bridges of Italy’s city built on water. Sources reported that the family enjoyed some gelato at La Lateria Lo Squero, located in the Dorsoduro neighborhood of Venice. According to the owner of the ice-cream shop, the family enjoyed a myriad of flavors: lemon, black cherry, vanilla, caramel and strawberry, during their sweet-tooth stop. Additionally, the family enjoyed some Italian fare when they had lunch at Enoteca Cantinone Gia Schiavi. A restaurant and wine bar, the couple indulged in a bottle of red wine and even purchased two for the road. And of course, a vacation in Venice would be incomplete without a gondola trip along the winding canals. So naturally, the entire family jumped aboard and enjoyed the ride. The short trip to Venice was a break for Angelina, who is currently in Paris filming the new movie The Tourist with Johnny Depp — who also recently visited Venice. Next Article Next Article Bring Your Child To Work Day – Is Air Traffic Control Child’s Play?